This year marks the 35 anniversary of the Great Chicago Shootout, where in a blind tasting of 221 Chardonnays, the 1977 Grgich Hills Chardonnay was proclaimed the champion. Winning this never-before contest solidified Miljenko “Mike” Grgich’s reputation as “The King of Chardonnay.” To celebrate this historic event, we created a blend showcasing the best lots of Chardonnay from our certified organic vineyards, crafted in the same elegant, winning style. The Shootout was one of Mike’s many accomplishments and a clear reason why he was inducted into the Vintners Hall of Fame! 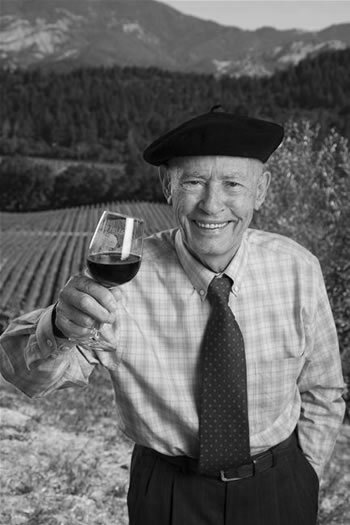 I have worked for some of the legends of Napa Valley: Lee Stewart, of the original Souverain Cellars; Brother Timothy at Christian Brothers; for almost nine years for Andre Tchelistcheff at Beaulieu Vineyards; for Robert Mondavi; and then Chateau Montelena, where the Chardonnay that I crafted won the famed 1976 Paris Tasting. I then partnered with Austin Hills to start Grgich Hills Cellars on Independence Day 1977. Education: University of Zagreb, viticultural and enology. Inducted into the Vintners Hall of Fame in 2008. Our goal remains the same as when I started the winery more than 35 years ago: to craft a wine that is harmonized. To me, that means not too much oak, not too much alcohol, not too much of any one attribute. In other words, we craft a whole wine that is a pleasure to drink.